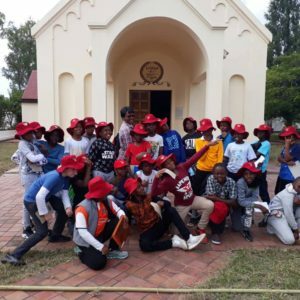 School Rules must be viewed in a positive light: they are necessary to ensure a disciplined environment where boys can live their lives in a Christian manner, exercising self control and trustworthiness, and respecting one another and the rights and property of others. School Rules and Regulations are designed to encourage good behavior and care and concern for others. 1.50-2.25pm. Clubs 2.25-3.25pm. Sport 3.30-4.45pm. All boys to be collected no later than 5.30pm. UNIFORMS: A complete, correct and clean uniform is required each day. Blazers and hats must be worn to and from school. Blazers must have the full complement of buttons: Two-button blazers are done up by the top button only, three-button blazers by the middle button only. Blazers should be dry-cleaned periodically. They are not normally worn in class and should be kept either on the class hooks or in lockers (minus valuables). The correct games kit must be brought when required. If boys go home in a collared sports shirt, they must wear a blazer or a tracksuit, foot wear and hat. If boys wear a non-collared shirt or t-shirts, they must go home in a tracksuit, footwear and hat. At the swimming pool all clothing must be hung on hooks and not left on the floor. All boys must wear their name badge. Lost name badges will be replaced by the School, at a cost to the parents. Grey longs are worn with white shirts as best dress. Grey long-sleeved pullovers may be worn to keep warm. 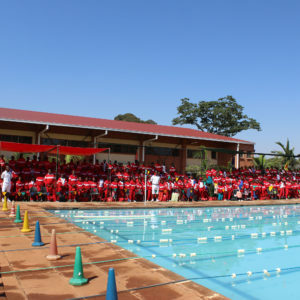 A red school tracksuit is required for sport practices. In winter boys may wear track longs to school and a school jersey may be worn under their blazer. All clothing must be clearly marked with indelible ink or preferably name tags. 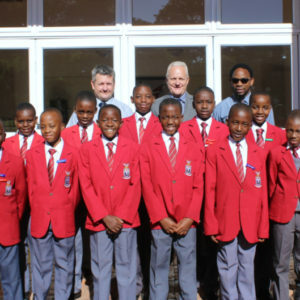 Boys must be smartly dressed if they are off Campus in school uniform. COURTESY: When greeting adults, especially visitors, boys must stand, raise their hats, look the person in the eyes and smile. Help must be offered when called for or thought necessary. THE HOUSE: Boys must not linger in the House before school, at break-time or at cleaning time (2.30 – 4.00 pm). The House is a quiet area and there should be NO shouting, running, whistling or raucous behavior at any time. Boys (except Head Boy and Deputy Head Boys) may not use the main entrance or front stairs unless they are accompanying adults or have permission to do so. 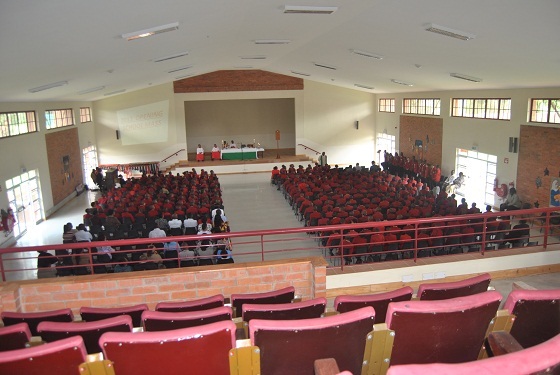 THE CHAPEL: Boys are encouraged to visit the Chapel to pray. The Chapel and its surrounds must at all times be treated and used with the greatest respect. School line-up at the front steps will not take place when it is raining. Boys must remain indoors and may be dropped and collected at the Tank, Pavilion or the Jubilee Hall entrance. JUBILEE HALL: The Hall is normally out of bounds and is not a play area unless there is supervision. No ball games, running or horse-play must take place in it. 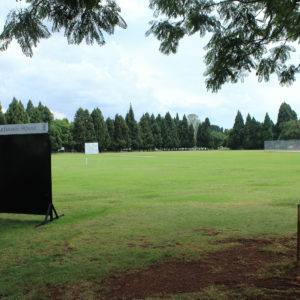 Boys may shelter there in wet weather and be picked up at the entrance. Areas such as the Stage, Gallery, change rooms and toilets are out of bounds. PIANOS: Boys (one at a time) may only use these for practice IF they take proper lessons and are doing formal practice under adult supervision. Unless supervised by a member of staff the Front steps and Entrance Hall, the Reference Library, the Art Room, the Computer Room, the Caretaker’s Room and all staff accommodation are out of bounds. 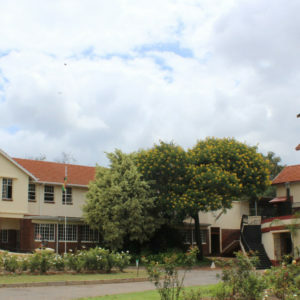 The following areas are also out of bounds without permission; College and College fields, the back drive to the College, all car parks, all roads outside the two booms, the area behind the Hall, the Sick Bay, the Kopje near the Shona Village, the roof and sides of the water tank and the pool enclosure. Boys must stay away from prepared Cricket squares. Classrooms and the House are to be vacated from 3.30 – 4.45pm for cleaning purposes. No boy should come back to the classroom after 3.30pm, until end of sport at 4.45pm. PLAY AREAS: These include the Farwell, Nixon, and swimming pool fields. MONEY: Fees or money for activities must be handed in before morning lessons to the class teacher. VALUABLES: Boys are not permitted to bring valuables to school and the school cannot accept responsibility for such items that are stolen. Watches are permitted at the owner’s risk but should be handed into a teacher if taken off for swimming or games. Most losses come as a result of leaving valuables, money, etc. unattended in the locker room or in desks, or leaving clothing on the fields over-night. Valuables must be left at home or kept on your person. Cell phones are not allowed at school or on school outings. This includes watches that have cellphone capabilities or smart watches that can connect to the internet. These items must remain at home! THEFT: If a boy is found guilty of theft he will probably be excluded from school until the incident has been fully investigated. FORBIDDEN: Fighting and bullying are forbidden at school as are knives, razor blades, toys that shoot, bows and arrows, catapults, expensive toys, computer games, valuables and cell phones. No trading in items of value and borrowing money is allowed. No matches, cigarette lighters, fireworks or dangerous chemicals. Pornographic magazines are not permitted at school. The use of undesirable, dirty, abusive, obscene, or offensive language is not permitted. Do not go into other boys’ classrooms, cases, desks, lockers or blazers. VANDALISM: Carving, writing or scratching school property will be repaired and paid for by the culprit and, if serious enough, could result in expulsion. Vandalism of any kind is serious and will be punished. LITTER: Be proud of your school – do not litter, pick up litter. Use the different colour dust bins provided. PICK UP/DROP OFF: Boys should alight from and board vehicles on the right so as not to cross the traffic in the morning. If alighting on the back drive, boys should alight on the side of the school so as not to cross traffic. SICK BOYS: Boys who are unwell should not come to school. A note from the parent is necessary after an absence of one or two days but a doctor’s note is required if the absence is longer. The Sick Bay Matron must be informed of all medical problems and all medication must be handed in to her. 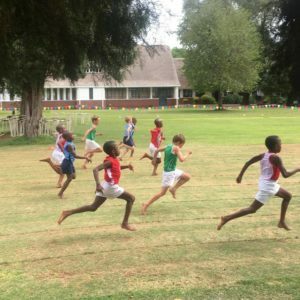 Excuse notes for sport, swimming, etc. should be given to the sickbay matron, who will pass it onto the class teacher and teacher in charge of sports. Accidents which occur at school must be reported immediately to the teacher on duty and recorded in the Accident Book. The boy must report to the Sick Bay Matron. Chronic Illness or conditions such as Asthma, epilepsy, diabetes, allergies or any other health problem. Any medication the boy is taking. Change of contact telephone numbers/cell numbers, e-mail addresses, physical addresses of parents/guardians. Should your son need an appointment with a doctor/dentist/physiotherapist etc, PLEASE try not to make it during the school morning or an afternoon when he has a sports/club commitment, unless it is an emergency. If it is unavoidable, inform the San Sister in writing and she will notify relevant staff. SCHOOL EQUIPMENT: Boys are not normally permitted to operate any electronic equipment unless supervised or instructed by a teacher. All Sports Equipment must be used in the presence of the specific Coach/Teacher. Marimbas or any other musical instruments/apparatus, may not be played unless the boy(s) is under direct instruction/supervision of a music teacher. A boy will attend afternoon activities from Monday to Thursday. ie. boys stay at school from Monday to Thursday from 7.25am, until 5.00pm. Commitment to a sport means commitment to matches (which may be held on Saturdays). ALL boys must attend supervised homework on Monday to Thursday from 1.45 – 2.30 pm. 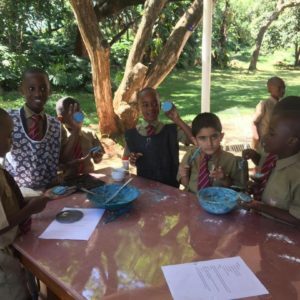 A boy who regularly fails to complete his homework assignments at home will be put on a Homework Report and will attend detention and might well have to miss sports practices/matches to catch up. There is no supervised homework period on Friday and boys must do their homework in their own time over the week-end. READING: Every boy should be in possession of a book from The Library and do free reading daily in addition to the reading requirements of class teachers. Reading is the key to success in all school subjects and even a little done often produces results. CLASS P.E. is part of the Compulsory P.E. Programme and boys must bring a costume and towel in the 1st and 3rd term every day. A note is required if a boy is not able to do P.E./Swimming; otherwise the boy will swim. LUNCH: Boys should bring their own packed lunches or can order lunches from “Manuelo’s Kitchen”. Details re these lunches can be obtained from Mrs Maunze, in the Reception office. TELEPHONE: The phone can only be used with permission from a member of staff. It should not be used to ask for kit or lunch that has been left behind. Non-emergency calls will be charged for. No boy may swim in the pool unless there is a teacher or responsible adult in charge. Permission to swim is always required. The fenced pool area is on all other occasions out of bounds. Do not enter the pool if you have mud on your feet. Use the toilet before you swim. No running or chasing in the pool area. No pushing in, ‘bombing’ or rough play. Be considerate of those who cannot swim well. ‘Shallow’ diving only with hands in front of head. Floats must be looked after – they can save lives. All valuables, money, watches, etc. must be left with the teacher at the pool or locked up in the classrooms. Use own costumes, towel and footwear – no lending/borrowing. N.B. Rules are not necessary when boys think and act sensibly and when they consider the needs of others.